Want to get more accurate data about your visitors to your Facebook Instant Articles enabled pages? It’s easy with the MonsterInsights Facebook Instant Articles Addon. You must use the Instant Articles for WP plugin by Automattic for it to work. In this guide, we’ll explain how to install and activate the Facebook Instant Articles addon. Facebook Instant Articles is a Facebook project that allows publishers to distribute fast, interactive stories on Facebook. To deliver content almost instantly to your visitors, Instant Articles loads a stripped-down version of your site and are preloaded in the Facebook mobile app. According to Facebook, Instant Articles enabled pages are 10 times faster than standard mobile web articles and readers are less likely to abandon your articles before they load. Track titles accurately: Instant Articles messes with the title of the page. In Google Analytics, it is typically shown as not set. Our addon fixes this issue and accurately track the title in Google Analytics. 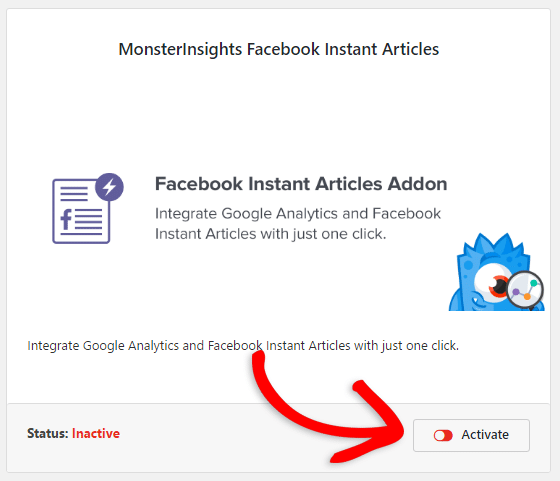 Supports other MonsterInsights features: In your Instant Articles, you can also track the performance of your ads, outbound clicks and also supports other MonsterInsights features. You’ll also need to have Automattic’s FB Instant Articles plugin installed and activated, and you must be running WordPress version 4.6 or newer. 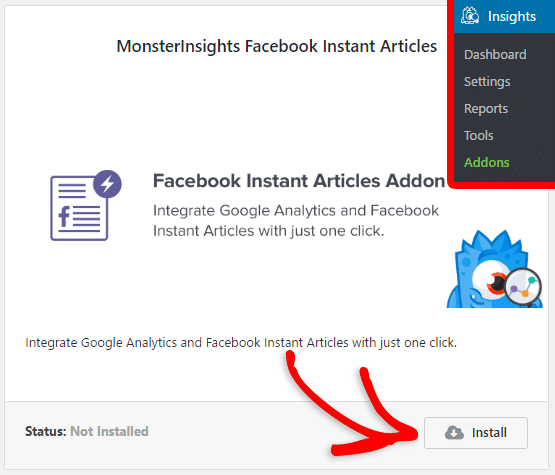 First, go to Insights » Addons and click Install under the MonsterInsights Facebook Instant Articles addon. You’ve successfully installed the Facebook Instant Articles addon. No further configuration is required. You can now accurately track your Facebook Instant Articles in Google Analytics. You might also want to check out how to enable AMP tracking with MonsterInsights.